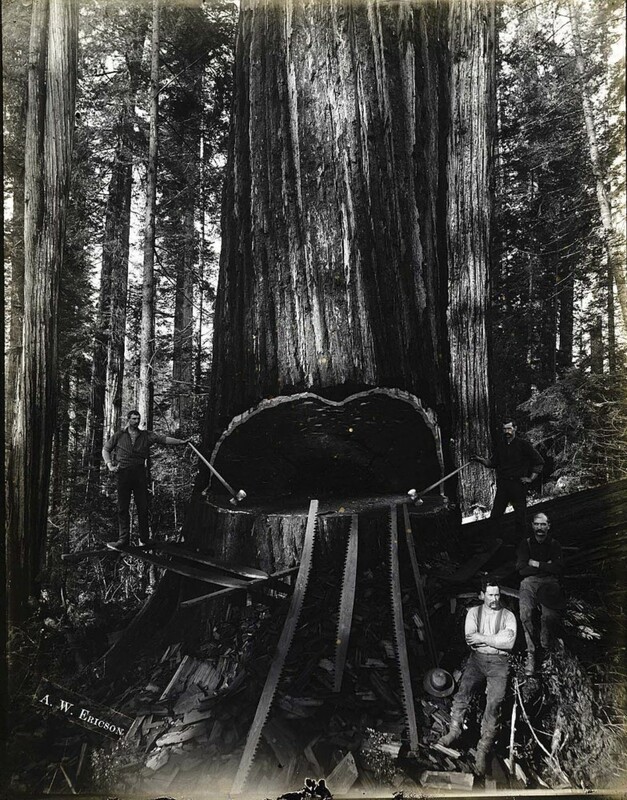 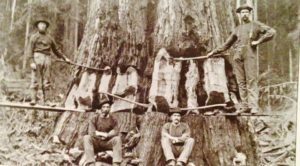 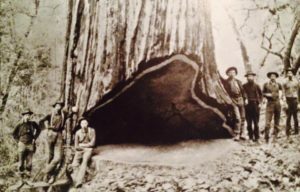 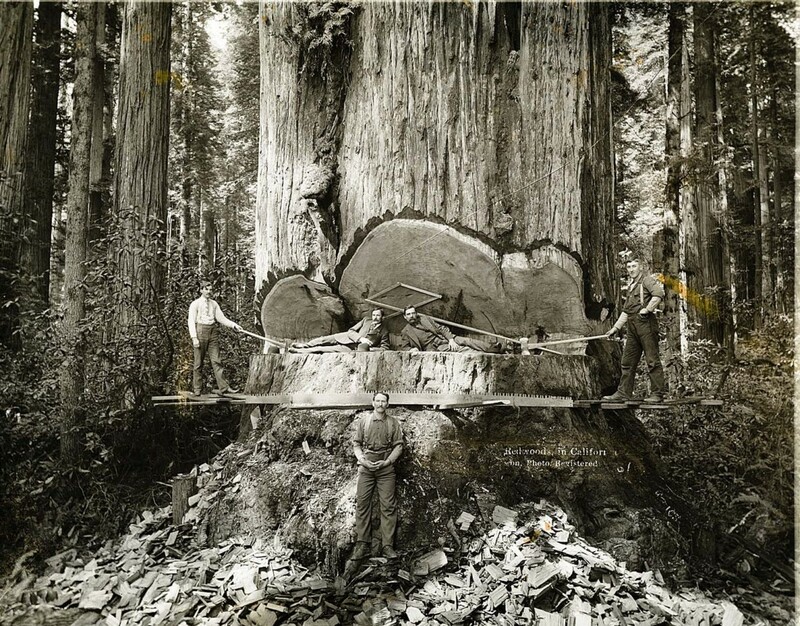 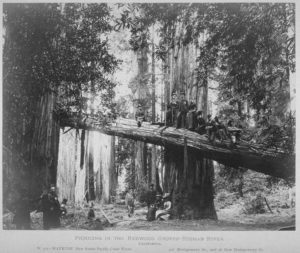 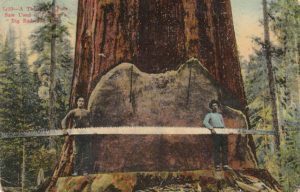 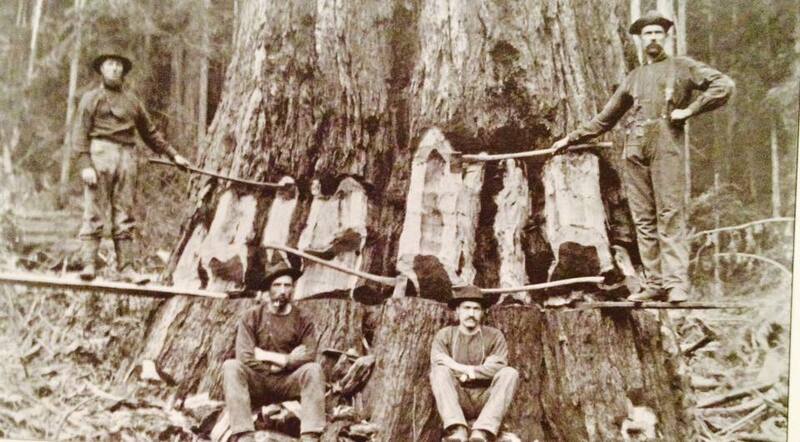 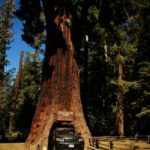 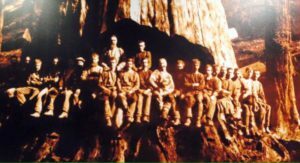 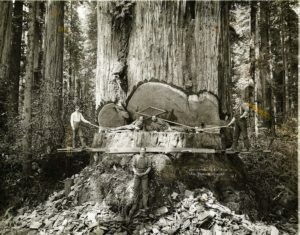 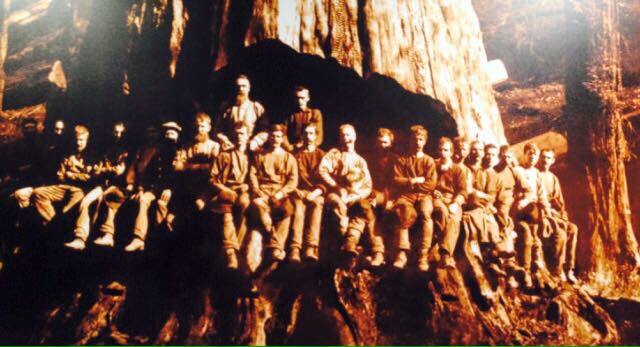 What happened in the life of a 1,341 year old redwood? 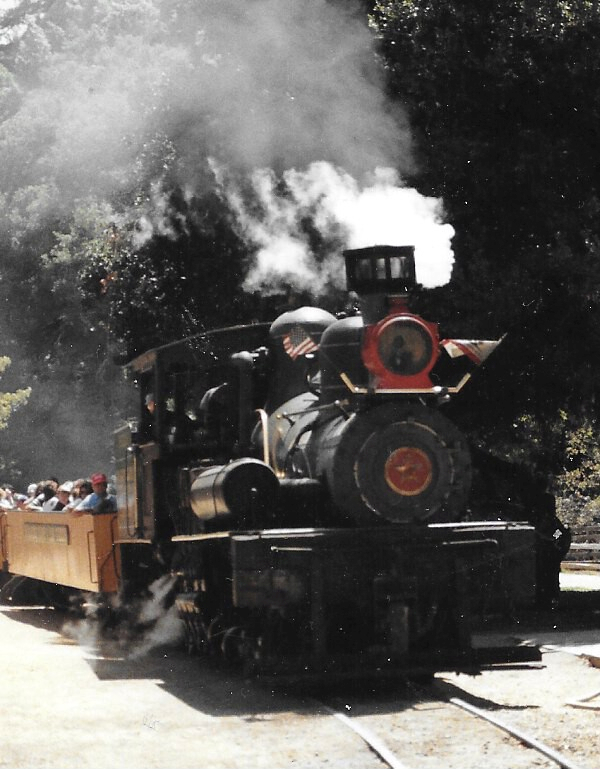 We, as in our computer guru, Roger Thornburn and me, are in the process of creating posters to affix to the outside wall of our (The Mendocino Coast Model Railroad & Historical Society) soon to be Museum/Library. 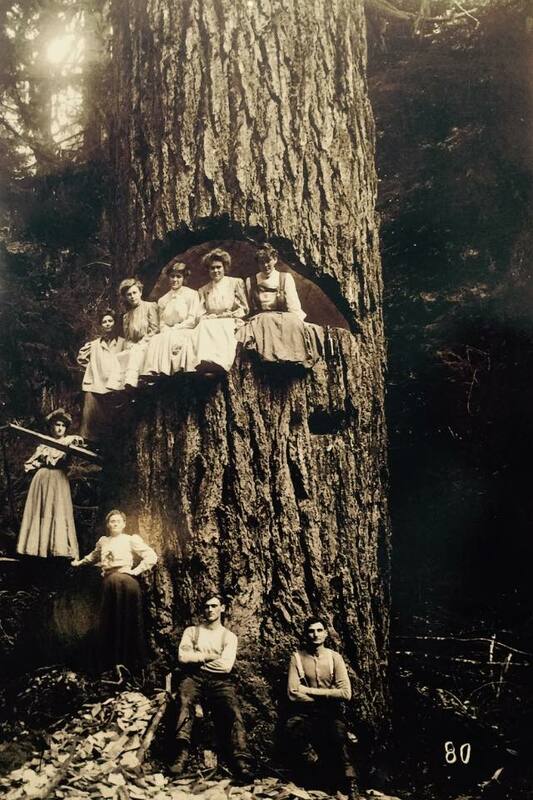 The photo below must have been taken a long while ago based on the last date and the clothes the man is wearing. 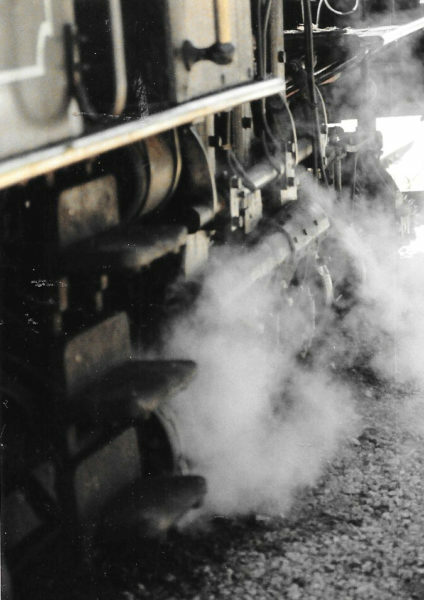 The copy I gave to Roger was quite grungy. 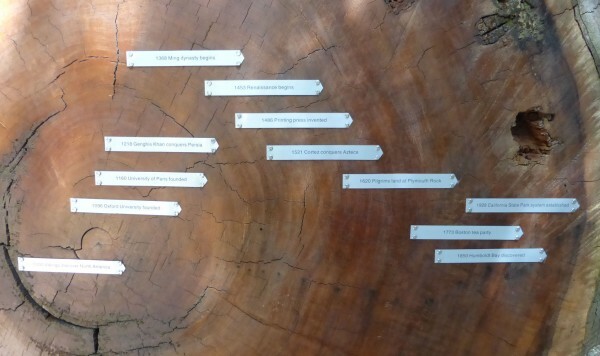 He’s done a great job of cleaning it up and making all the data readable. Double click on the photo to see all the dates clearly. 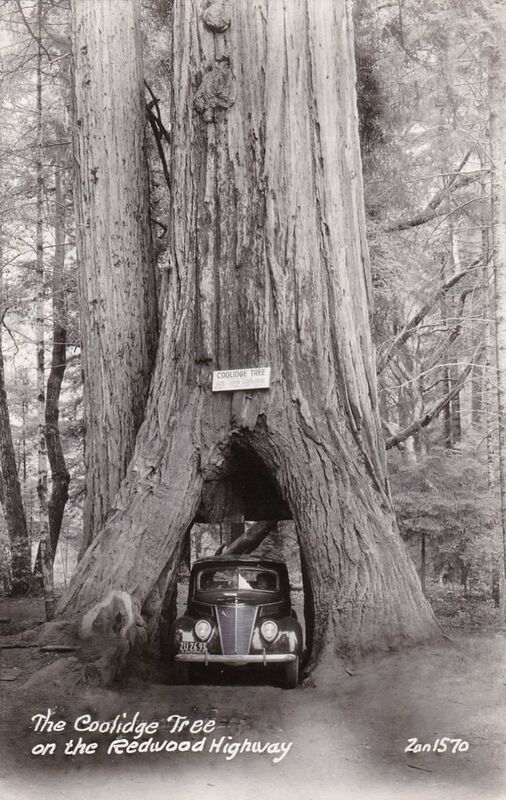 Posted in Redwoods and Big Trees. 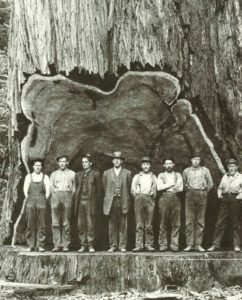 First, where is Leggett? 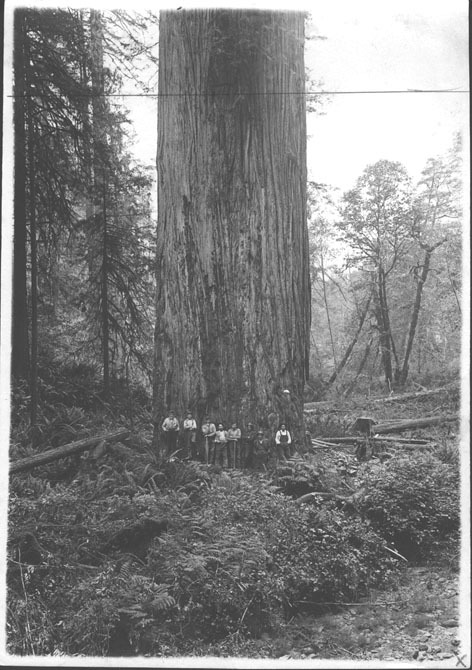 Leggett (formerly, Leggett Valley) is a place in Mendocino County, California. 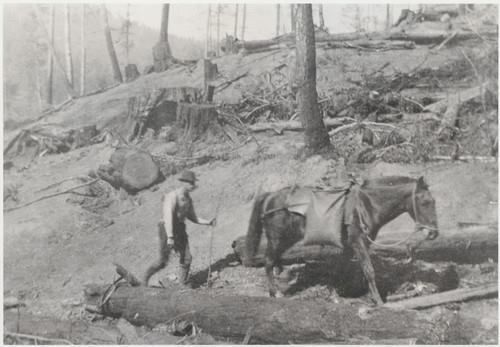 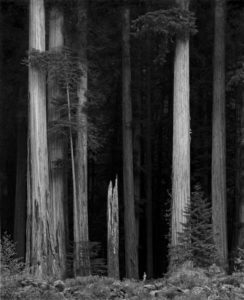 It is located on the South Fork of the Eel River 17 miles northwest of Laytonville, at an elevation of 984 feet. You can get there from Fort Bragg (the home of our club’s Model Railroad Layout) via a VERY twisty State Route 1, whose northern terminus with U.S. Route 101 is just outside the community. How big is it? 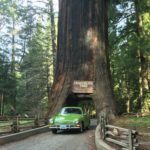 The town of Leggett includes a single gas station, K-12 school, a convenience store, pizza parlor, fire station and Drive-Thru Tree. 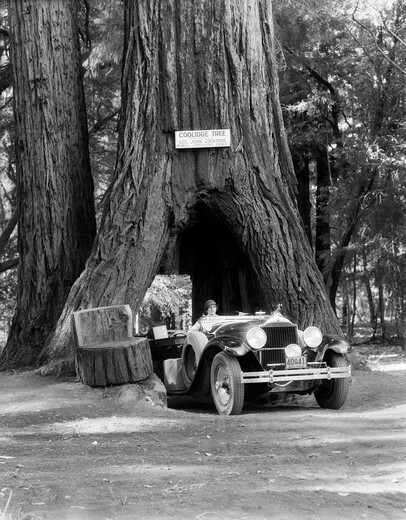 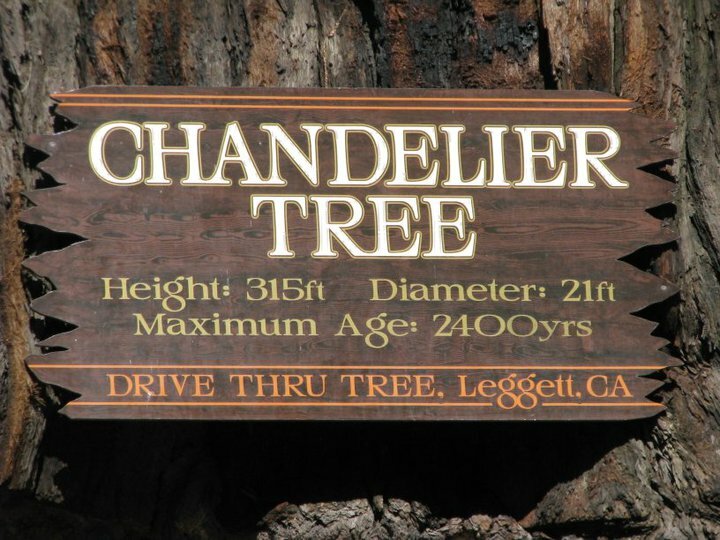 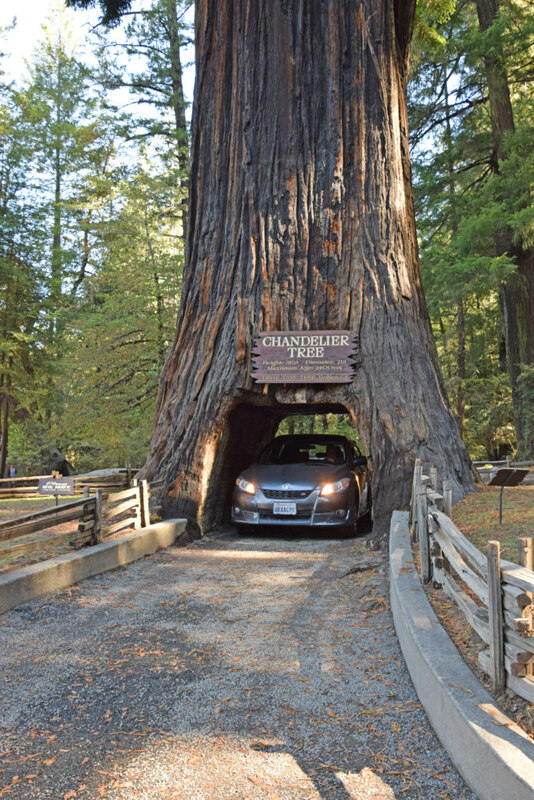 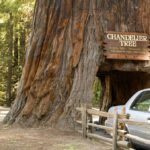 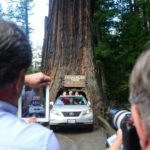 The Drive-thru tree is named the Chandelier Tree. I love big trees. One of my great pleasures is taking a drive to Eureka and stopping in at the Avenue of the Giants. 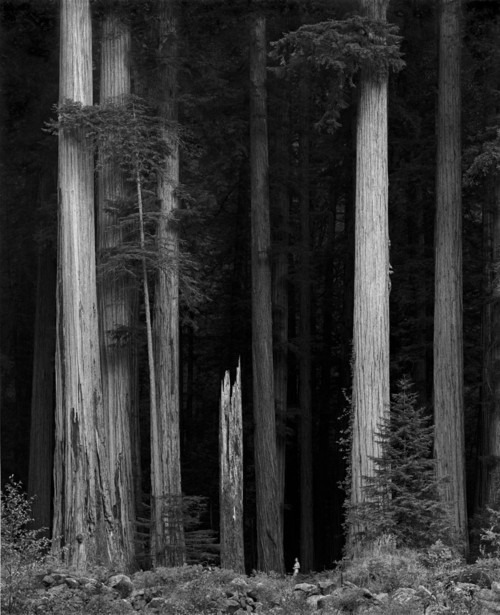 I like it best when it’s pouring rain!!! 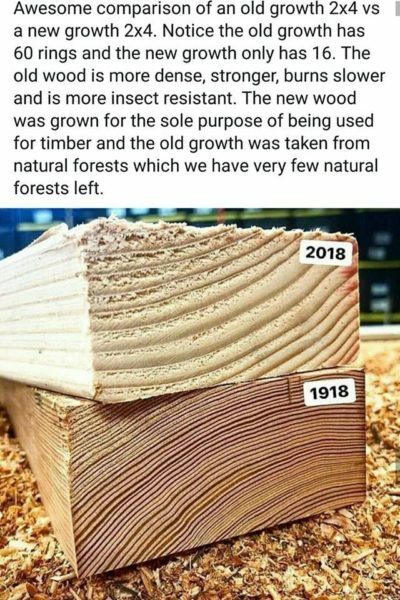 Amazing isn’t it. 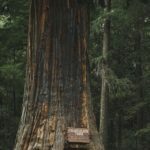 I don’t know how old the trees are in the gallery below apart from a lot. Alas I have few details of where they were located or cut. 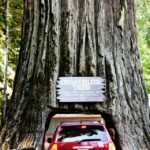 Double click on any one to set the gallery in action. 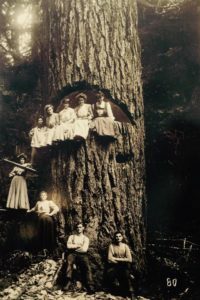 I visited the Dyerville Giant when we went to Humboldt State University Library recently. 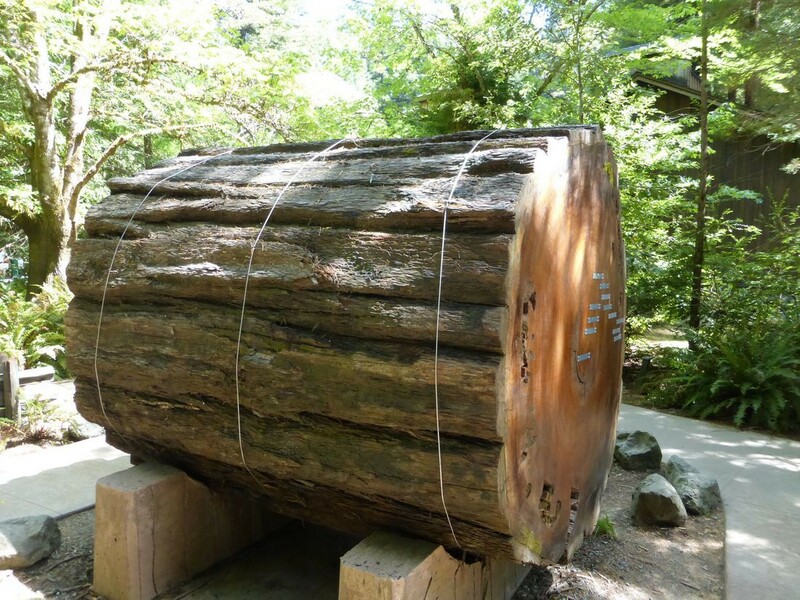 It is simple awesome even though it is on the ground. 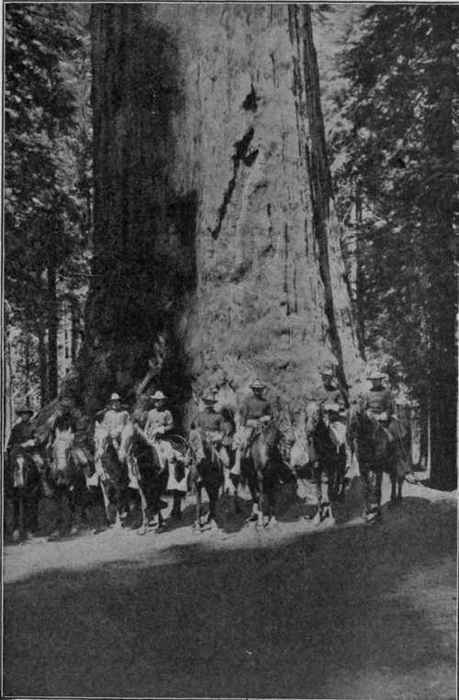 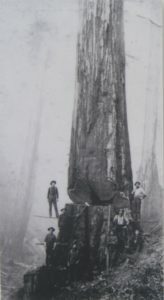 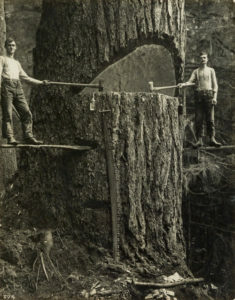 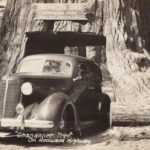 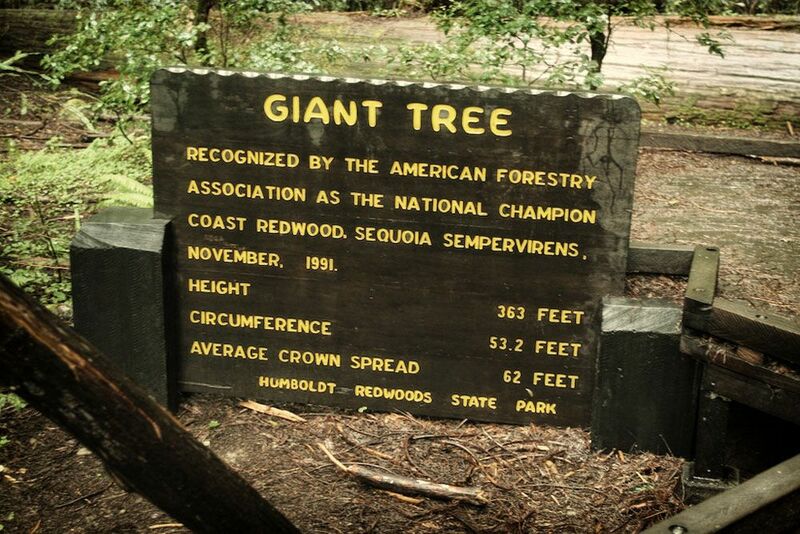 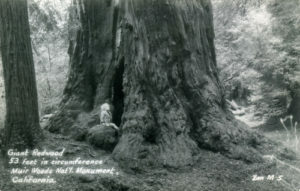 The Dyerville Giant was recognized as the “Champion” Coast Redwood as certified by the American Forestry Association until it fell on March 24, 1991. 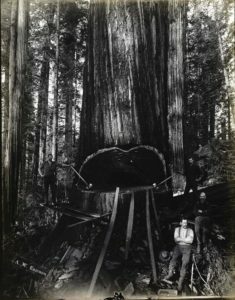 Before it fell, it was at least 362 feet tall (estimates from two different sources measured it at 370 feet after it fell). 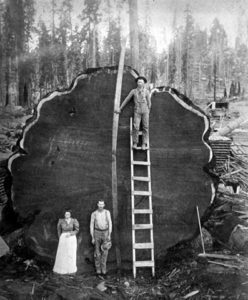 That is 200 feet taller than Niagara Falls or comparable to a 30-story building. It probably weighs over 1,000,000 pounds. 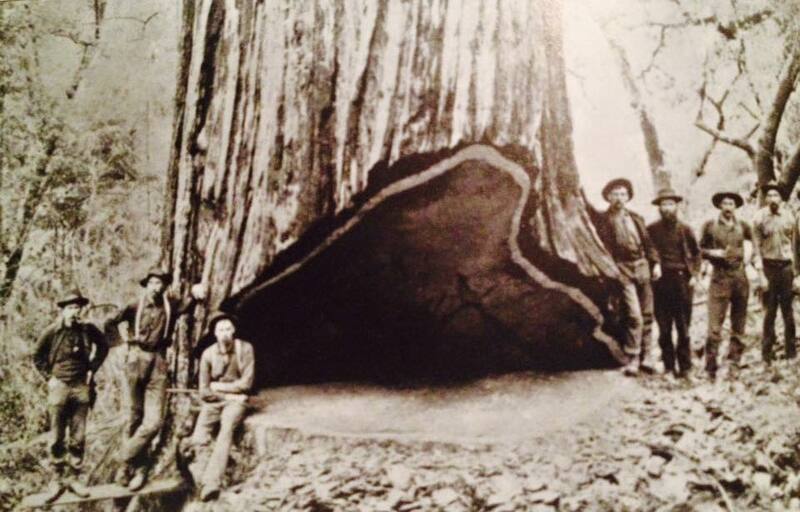 It is 17 feet in diameter, 52 feet in circumference and possibly 2,000 years old. 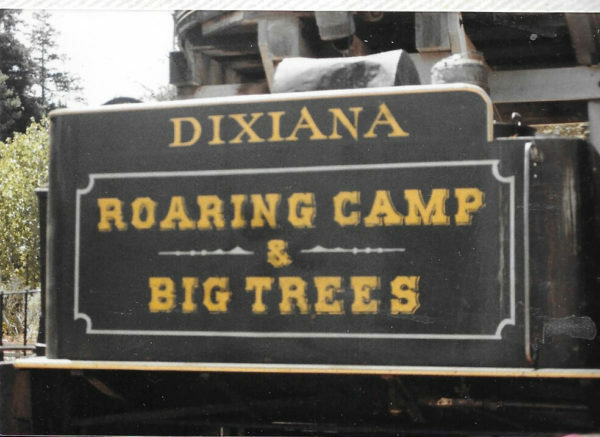 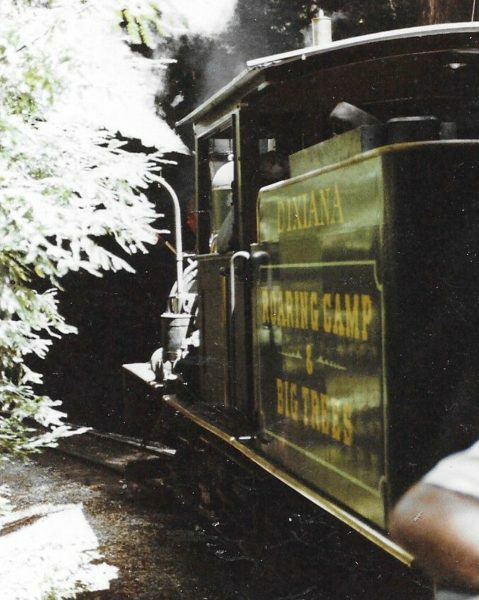 The Dyerville Giant’s long life came to an end one March morning in 1991 with a sudden thump in the forest. Pacific storms had battered the Humboldt redwoods with the ferocity of a 15-car pileup. 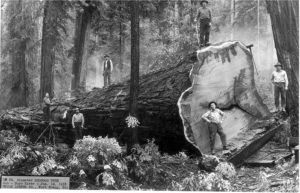 Gale-force winds often accompany spring storms with heavy rain, a particularly perilous combination for big trees. The Founders Grove in Humboldt State Park took the brunt of the storm and four old trees tumbled, leaving the Dyerville vulnerable. 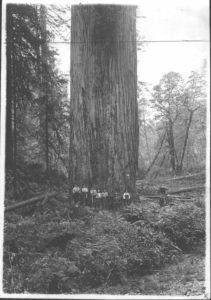 Redwoods are like mountain climbers attached to ropes: The trees depend on each other through a latticework of shallow roots that do not clench deep into the bowels of the Earth for anchorage. 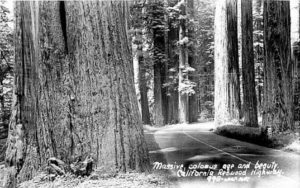 Instead, they look something like crocheted welcome mats spread across the forest floor. 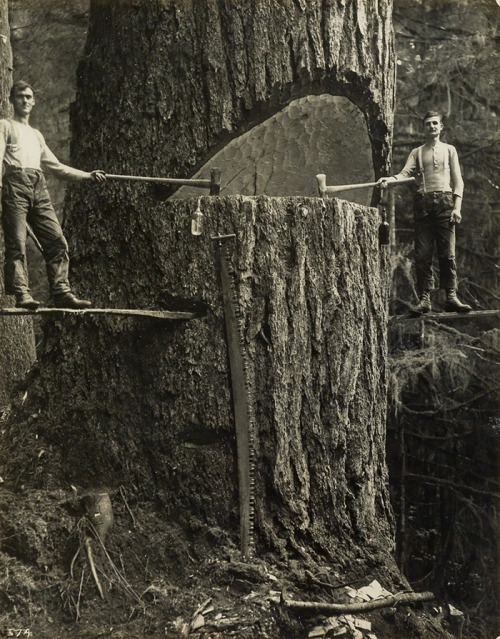 The felling of one tree weakens the entire structure. 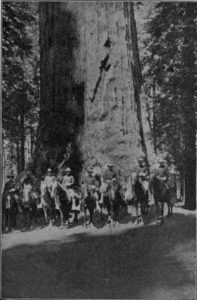 When the Dyerville Giant suddenly lost the protection of the others to block the wind and keep it stable underneath, it fell, leaving a gaping hole in the spongy earth below. The dead tree can be found on an easy, self-guided, half-mile tour at the Founders Grove. 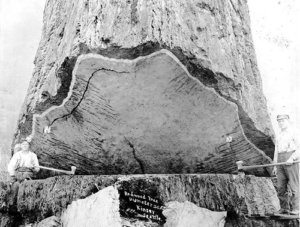 This slice is about five feet across. The labels on one side really got me going ….. 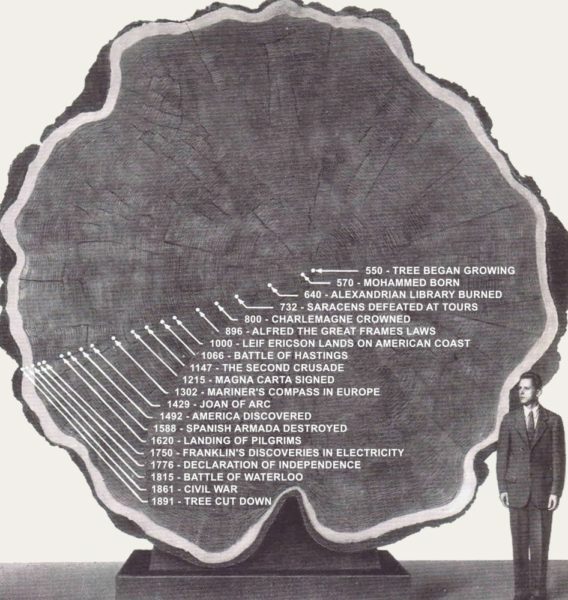 The bottom left label says that was the size of the tree at the 70 foot height when the Vikings landed in North America. Click on the picture to enlarge it and see the other labels. 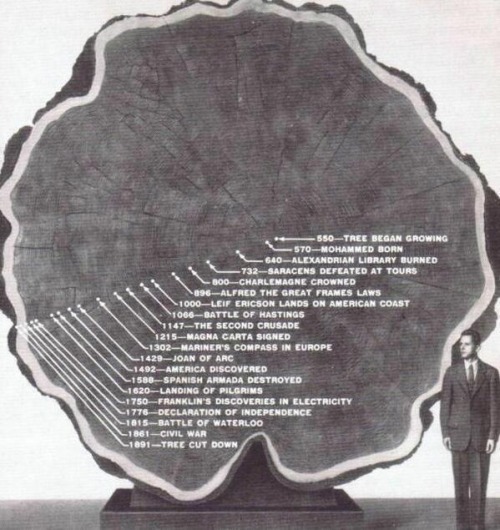 What a slice of history.